Taste test: These kettle-style chips were irregularly shaped but generally wiggly, with brown around some edges. 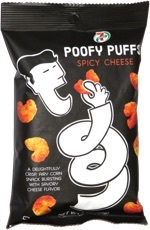 They were crunchy, crisp and very, very tasty, just loaded with great potato taste. 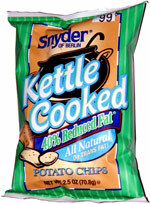 So among kettle chips, they're definitely among the best. And this doesn't even take into account the 40% reduced fat factor, which is nice to know, but mainly we were impressed with the texture and taste of the chips. Smell test: Good potatoey, salty smell.